Used to grease the wear bushings in hydraulic breakers, Epiroc's new bio chisel paste helps prevent bushing wear and prolong working tool life. The formulation is based on special synthetic esters that are easily biodegradable, and have been approved by the European commission for use in environmentally sensitive applications. Dynaset exhibited its new HPW250 hydraulic high pressure water pump along with a selection of hydraulic equipment at the FinnMETKO trade show. Other partner company’s also exhibited Dynaset solutions, with Sennebogen exhibiting its 825 mobile material handler with Dynaset HMG Pro 6kW hydraulic magnet generator. 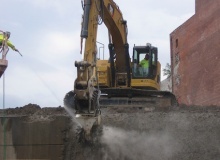 Antraquip now offers several hydraulic rock and concrete grinders for excavators ranging from 1t to 110t. The rock and concrete grinders are suitable for trenching, controlled demolition, scaling, soil remediation, tunnelling, underwater cutting and general rock NEW MODEL TNB-80K for 70 ton - 100 ton Excavator excavation. Red Rhino has expanded its dealership network by entering the Japanese recycling sector with the appointment of Nikko Co Ltd (Tokyo) as its authorised distributor, with the company recently welcoming representatives from the Japanese company at its manufacturing facility in Grantham, Lincolnshire. 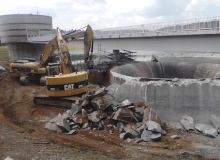 Two Rockwheel D30 cutting units have been used for demolition work at the Zeulrenroda flood relief system in Germany. So called ‘concrete cancer’ had eaten away parts of the relief system, thereby necessitating renewal. 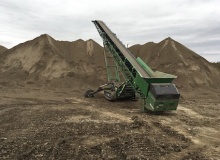 McCloskey has added new all-terrain stackers to its line-up. The stackers blend the benefits of onsite track mobility with the high productivity of a radial conveyor. 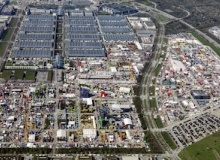 Ecomondo is an exhibition focusing on products and services for the ‘green economy’. 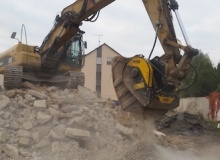 Due to the focus of the show, MB Crusher exhibited its Triple R System, which reduces, reuses and recycles inert material directly at construction sites. These saws are made for walking but cutting they do too! 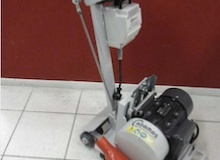 Coming in all shapes and sizes, these ubiquitous machines are used by concrete cutting professionals almost on a daily basis. 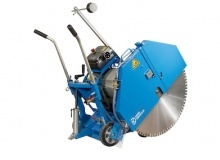 Depending on the location and application, they might be called walk-behind saws or floor saws or flat saws or road saws or pavement saws; you name it. 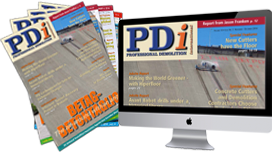 PDi’s Andrei Bushmarin presents a digest of the latest news from the sector. The exciting capabilities of the ALLU range of Proces- sors and Transformers will be shown at bauma China 2018. As the largest trade show in Asia, ALLU will show at first-hand how its equipment can help construction companies maximise their business, whatever the application. The primary reason for running a renovation project is usually to add value. Whether that’s by rectifying a problem, updating an offering or optimising the space, renovation can improve both the function and aesthetics of a business. Rugged American haul trucks designed for bulk material transportation are pairing up with high performance Liebherr equipment as part of a greywacke extraction process undertaken by German company, Günter Jung GmbH. 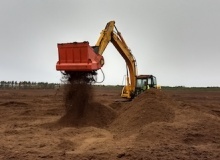 Australian specialist construction equipment supplier RDW (together with subsidiary Qld Rock Breakers, QRB) has recently become the authorised distributor of Allu Transformer and Processor bucket attachments in Australia. 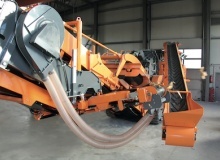 Austrian company Rockster Recycler GmbH has developed a wind sifter retrofit kit for its mobile crushers. The Cava La Pedicara quarry in Balvano is one of the largest in southern Italy, being located in the heart of the Lucanian Dolomites. The start of building work for the S21 tram line is slightly delayed, but now an excavator cutting unit from Erkat is being used to meet the special building and structural challenges posed by the building site.